This chicken and pasta casserole is big on flavour and easy to prepare. Made with pasta, canned soup, green chilies, chicken and cheese, our Creamy Chicken, Green Chile & Ziti Casserole is a weeknight winner. Cook pasta as directed on package, omitting salt. Meanwhile, mix soup, sour cream, green chilies and cumin in large bowl until blended. Drain pasta. Add to soup mixture along with the chicken; mix lightly. Spoon half the pasta mixture into 13x9-inch baking dish sprayed with cooking spray; top with half the cheese slices. Repeat layers. Cover with plastic wrap, then foil. Freeze up to 1 month. Heat oven to 350ºF. Remove plastic wrap from casserole; re-cover with foil. Bake (frozen) casserole 1 hour or until heated through, uncovering after 45 min. Top with cilantro before serving. Serve with a mixed green salad tossed with your favourite Kraft Dressing and a glass of milk to round out the meal. 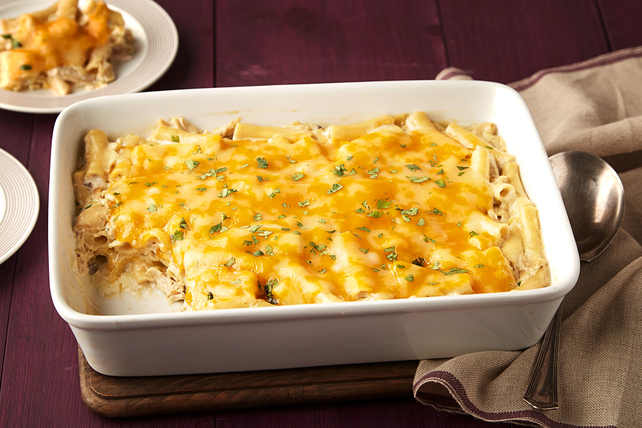 You can use a rotisserie chicken to easily prepare this delicious casserole. An average-size rotisserie chicken purchased from your supermarket should yield the 3 cups chopped cooked chicken needed to prepare this recipe. Heat oven to 400ºF. Assemble casserole as directed but do not freeze. Bake 25 min. or until heated through. Sprinkle with cilantro before serving. Prepare using Cracker Barrel Monterey Jack with Jalapeno Natural Cheese Slices.